The Rest of Us Just Live Here follows a group of friends in their last few weeks of high school, building up to prom, before they all got their separate ways. All they want is to be able to graduate without their school blowing up, as it looks like those beams of blue light appearing all over the place might announce the end of the world … again. But that’s ok, because Mikey, Mel, Henna and Jared aren’t ‘indie kids’ so they won’t be the ones who go fight evil. 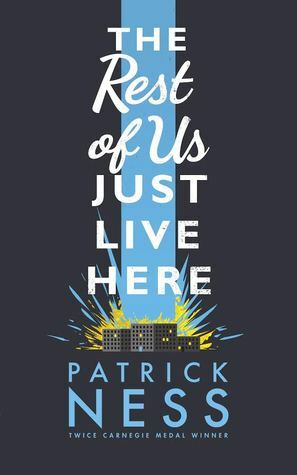 No, they are the ones trying to continue to lead ordinary lives in sometimes extraordinary circumstances; for Mikey, it is trying to hold his life altogether while everything and everyone seems to be slipping away. Can they make it, unscathed? Mikey and his friends, they are the kids at the perimeter of the supernatural action going on in YA books. They are if you like, the extras in the Twilight movies: the kids filling the playground, the kids sitting in the cantine. They are not the chosen ones, not the beautiful ones. They are just kids, trying to get on with life, and even ordinary life can be tough sometimes. The clever construction of the narrative allows for all the supernatural shenanigans to run as a parallel narrative, in the form of a summary at the start of each chapter, with some dotted direct entanglement in Mikey’s story. The reader therefore is always left on the periphery of that supernatural action, giving it an instant distancing between us, the regular kids, and the indie kids. That parallel narrative is so succinct, so matter-of-fact, that it often sounds tinted with derision. Whether or not Ness is purposely having a go at some sub-genres of the YA market, it sounds to me like it is done more with jest than malice; I dare anyone not to laugh at some at the more obvious references, which I won’t spoil for you here. Mikey’s problems might not be of epic-save-the-world proportions but they are nonetheless important. His low self-esteem, his anxiety … it is raw, so real. The conversation with his therapist about taking medication for anxiety, his final decision not to accept Jared’s help … Mikey is such a guy, a lovable, dedicated guy, so full of all the doubt teenagers struggle with everyday. And this is exactly what makes this book so wonderful. It is a declaration aimed at teens everywhere: YOU matter, whatever you do, however insignificant you might feel sometimes, you DO matter. What more can we, as adults, as “gate-keepers”, ask for from a book aimed at teenagers? I suggest you mark 27th August in your diaries right now. Clear the day. Read the book. Then give it to every teenager you know.